John Ireland, by conviction an Anglo-Catholic, spent over thirty years in the world of church music, twenty-two of them at St Luke’s, Chelsea, a church which enjoyed a healthy musical tradition and which encouraged him to contribute to music for the Anglican liturgy. 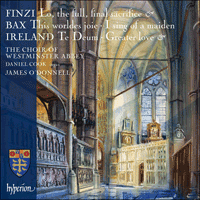 The Te Deum in F, composed in 1907, reveals Ireland’s indebtedness to the late nineteenth-century diatonic style of Stanford, Charles Wood and Bairstow, all of whom were active contributors to the Anglican repertoire at the time. The structure of Ireland’s canticle for Matins reveals some compelling connections with Stanford’s setting in B flat (a work firmly established in the repertoire at St Luke’s). The choice of tonal departures may be simpler than Stanford’s, but many of the crucial textual demarcations correspond, including the reprise of the tonic key (at ‘Day by day: we magnify Thee’) and the coda material that follows. Ireland’s use of a broad, memorable theme at the opening has much in common with Stanford’s interpretation. However, for the central portion of the work, Ireland elected to couch almost the entire text in a more plangent D minor (in marked contrast to Stanford whose internal ternary structure is based on a strident trumpet fanfare). This predilection for lyrical contrast, stirred in this instance by contemplation of man’s frailty and redemption (‘When Thou tookest upon Thee to deliver man’), could be attributed to Ireland’s more meditative character. The anthem Greater love hath no man was commissioned in 1912 for Charles Macpherson, the sub-organist of St Paul’s Cathedral. Intended as a meditation for Passiontide, Greater love hath no man drew its text from a compilation of scriptural passages in Daily Light on the Daily Path, a series of booklets containing Bible readings which Ireland used to observe on a regular basis. The anthem rapidly gained currency in cathedrals and church choirs and, with the outbreak of war in 1914, its text gained a special resonance as the casualties from the front mounted. Indeed, with Alice Meynell’s poem Summer in England, 1914, which contrasted the slaughter of Flanders’ fields with the tranquil scenes of England, and the subject of sacrifice emanating from pulpits throughout the land, Ireland discovered that his anthem inadvertently resonated with a wider national mood. Although Greater love might outwardly seem to be influenced by the English verse anthem, in reality it has the scope and narrative redolent of a small cantata in its manner of continuity and ‘dialogue’ between soloists and chorus (the latter indeed assuming the role of ‘turba’ in contrast to its more normal role of reflective commentary). Here Ireland adroitly assigns the words of Peter (1 Peter 2: 24), presented in the first person plural (‘that we, being dead to sins’), to the chorus, as if they were the people of the church. Similarly, Paul’s words from Romans 12: 1, ‘I beseech you brethren’, used to epitomize the anthem’s theme of self-sacrifice, are given initially to altos and tenors in unison before they are joined by a ‘willing body of believers’. And even when reflective commentary is operative, passages such as the opening twenty bars are afforded greater impact by the method of solo voices (tenor) being affirmed by full chorus. Although Arnold Bax’s main reputation resides in his instrumental music, notably in the cycle of large-scale symphonies he wrote between 1921 and 1939, his a cappella works have a fecundity which places them at the very summit of unaccompanied English choral music of the twentieth century. His fascination with the colour and symbolism of medieval religious poetry began with his masterpiece, Mater ora filium, a set of choral variations, composed in 1921, which set a structural precedent for the two works that followed, This worldes joie (1922) and I sing of a maiden that is makeless (c1923) for both explore elaborate processes of strophic variation. A decidedly gloomy essay, This worldes joie is characterized by its sighing chromatic lines announced in the first verse (‘When it cometh in my thought, Of this world’s joy’), but the sense of desolation gains in intensity with the introduction of an ostinato in the third verse (‘All goeth bote Godes will’) which accompanies the opening theme in augmentation. The motet was dedicated to William Gillies Whittaker, who certainly performed the work with his renowned Newcastle Bach Choir, though the first performance was given by Charles Kennedy Scott and the Philharmonic Choir at Queen’s Hall on 5 June 1924. The simpler I sing of a maiden that is makeless, a partsong in five parts which Bax dedicated to John Blackwood McEwen, makes abundant allusion to sixteenth-century polyphonic techniques of imitation, cambiata and English cadence, but this impression of the ‘old’ is subtly mixed with Bax’s kaleidoscopic vocabulary of chromatic harmony, apparent from the opening of the second verse. Moreover, Bax’s process of variation allows the original melody to dissolve in the more developmental third verse (‘He came all so still To his mother’s bower’), a course of action which subsequently throws into relief the glowing reprise of the theme in the final bars. By the end of the Second World War the name of Gerald Finzi had risen in prominence and, by the end of the 1940s, a number of his choral works, including his masterpiece, the solo cantata Dies natalis, had been performed at the Three Choirs Festival and elsewhere. In fact Finzi was initially unaccustomed to the notion of commissions, but after the war these began to proliferate, placing demands on his professional ability to complete works on time. Though not Christian by allegiance, Finzi avidly preferred to identify with all things English rather than with the Jewish-Italian background of his parents, and among these powerfully English elements—which included English literature and poetry together with an admiration for the work of Parry, Vaughan Williams and Ivor Gurney—was the music of the Anglican church, itself a powerful ingredient within the larger embrace of English cultural nationalism. To this he responded with imagination and individual insight. Lo, the full, final sacrifice was Finzi’s first work to be written directly after the war. Commissioned by the Reverend Walter Hussey (well known for his regular commissions of contemporary church music by Britten, Berkeley, Rubbra and others, and vicar of St Matthew’s, Northampton), Finzi’s ‘festival anthem’ was written after Alan Rawsthorne had, for a second time, let down Hussey over the production of his own commission (Banfield, Gerald Finzi, 327). Finzi’s anthem was therefore written at some appreciable short notice, yet this seemed not to inhibit the quickness of his inspiration. The subject matter, at Hussey’s suggestion, was the Eucharist and Finzi drew on English translations of St Thomas Aquinas’ hymns Adoro te and Lauda Sion salvatorem by the seventeenth-century poet and cleric Richard Crashaw. Deeply mystical in tone, Lo, the full, final sacrifice became a substantial conception, exceeding the normal bounds of a typical anthem in its length and treatment. And to match its richer structural design, Finzi’s matrix of musical transformations was also more complex and subtle. Knitted together to create larger homogeneous paragraphs, the shorter episodes provided illuminatory studies of selected lines from Crashaw’s text, accentuated by the composer’s distinctive ability for English speech rhythm and melodic contour; moreover, Finzi’s harnessing of numerous neo-baroque techniques, together with more modern, quasi-instrumental handling of the voices, served to give the larger structure a magnificent sense of elan and textural variety. Though there is a strong sense of through-composition, Finzi also furnishes the listener with powerful points of reference such as the majestic central climax (‘The sovereign subject sits above’), while the profoundly melancholic recapitulation of the lyrical idea used at ‘O dear Memorial of that Death’ in the form of a duet for tenor and bass (using Crashaw’s wonderfully potent and memorable analogy ‘O soft self-wounding Pelican!’) must surely lie among Finzi’s most enduringly moving choral utterances—along with the sonorous closing eight-part ‘Amen’. Three anthems, composed in 1946, 1951 and 1953, made up Finzi’s Op 27. The short ‘marriage anthem’, My lovely one was written for the wedding of his sister-in-law, Margaret Black, in Newbury on 2 September 1946. A surprisingly pensive, quietly passionate miniature couched in C minor (though always leaning flatwards by degrees to B flat minor), the anthem uses seventeenth-century words from Edward Taylor’s Sacramental Meditations, published for the first time in 1939. God is gone up was first sung at a festal morning service on St Cecilia’s Day (22 November) in 1951 at the musicians’ church of St Sepulchre’s, Holborn Viaduct, under the direction of John Dykes Bower. Again Finzi took his text from Taylor’s Meditations, but this time the demeanour of the anthem, march-like in its ternary form, has an ebullience worthy of Walton’s March Imperial or Vaughan Williams’s O clap your hands. 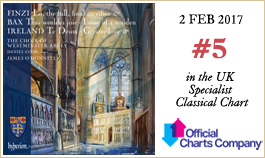 The third anthem of the Op 27 collection, Welcome sweet and sacred feast, was written at the invitation of Cyril Taylor and the Religious Broadcasting Department of the BBC in 1953. After a poem by Donne had been rejected, Henry Vaughan’s The Holy Communion was selected, and, perhaps not surprisingly, the composer’s response bears many similarities to Lo, the full, final sacrifice in its largely contemplative disposition and in many of the techniques deployed, including an elaborate network of thematic transformations derived from the opening melodic cell (one of Finzi’s inimitable thumbprints). The use of baroque techniques was a common feature in Finzi’s music, and the two-part setting of Let us now praise famous men from Ecclesiasticus XLIV, completed in December 1951, was no exception in its use of a walking bass line to portray the sense of a processional march. Shortly after its publication in 1952, Finzi received a commission from Iva Dee Hiatt of Smith College, Northampton, Massachusetts, for a setting of the Magnificat to be sung at the choir’s Christmas Vespers. Here Finzi’s deference to the baroque is realized in a concerto form where the seminal opening line of the text (‘My soul doth magnify’) recurs throughout the structure as a ritornello. But, like Lo, the full, final sacrifice, Finzi also includes distinctive secondary lyrical material in the guise of ‘For he hath regarded: the lowliness of his handmaiden’ which returns with commensurate poignancy (‘And his mercy is on them that fear him’). This, together with Mary’s exclamation, serves to punctuate the through-composed structure. In the moving final ‘Amen’, Finzi clearly looked back to the closing bars of Lo, the full, final sacrifice in their Bachian majesty and diatonic transparency; yet one also senses too that he was, perhaps, also paying tribute, however unconsciously, to Vaughan Williams’s Symphony No 5, for not only is the key (D major) the same, but the heartrending, yearning, richly contrapuntal texture seems to recall those resplendent, numinous concluding pages of the symphony’s finale.